Fond of Snape » Blog Archive » Round Robin Challenge: "Past Vs. Present"
Round Robin Challenge: "Past Vs. Present"
The challenge this week is “Past Vs. Present”. I was inspired by the picture up at the Round Robin site for this one…plus my Wolfie is just so darn adorable! 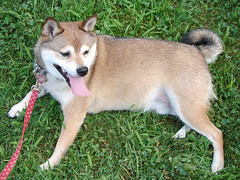 Wolf is a Shiba Inu, which is a Japanese breed. Shibas are considered a primitive breed and were originally bred to flush birds and small game and occasionally used to hunt wild boar (shibas top out at 25 pounds…are you starting to get the picture?). They are energetic, bold, spirited, and strong-willed, can be hard-headed & stubborn and are NOT good off leash. Shibas are escape artists extrodinaire (I’ve seen one climb an 8 foot tall chain link fence!) and will be oblivious to your frantic attempts to call him or her back when an interesting sight or scent catches their attention. They can be manipulative, and many are willful, obstinate, and dominant (they want to be the boss). You must show them, through absolute consistency, that you mean what you say. They have thick heavy coats, which they “blow” twice a year…or more! 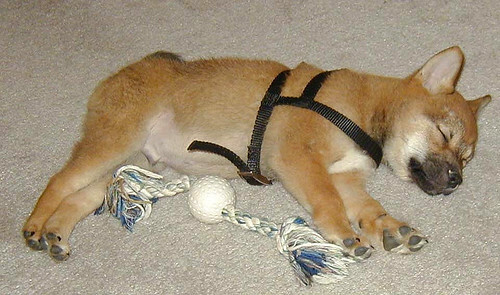 You will find shiba hair in places that shiba hair should never be LOL! They can be suspicious toward strangers and aggressive towards other animals…they have strong chasing instincts. This breed does NOT like to be grabbed or hugged or held tightly, and if pushed too far, may react defensively, so if you have small kids, they’re probably not the breed for you. A beautiful dog — it’s neat to see him as a puppy and all grown up. Great application of the theme, and nice pics! Fascinating! I used to be a total dog fanatic (had an AKC breed poster on my wall in 5th grade), but I’ve never heard of this breed. And wouldn’t you say the puppy picture looks a bit like Tuffy? Hmmm…. What a nice homage to the breed and to your special Wolfie. He seems very happy. You must feed him wild boar.!? What a cutie he is! Oh my, I wish he liked hugging, because he is so adoreable, how could one not want to hug him? Wolf looks so snuggle-ishious in both of those but what a cutie as a pup!